I just placed an order for a Flieger Klassik 40 Handwinding No Logo LIMITED. I know the "old radium" style luminova is of course designed to have the "vintage" aesthetic. While I suspect like past implementations like Steinhart etc. 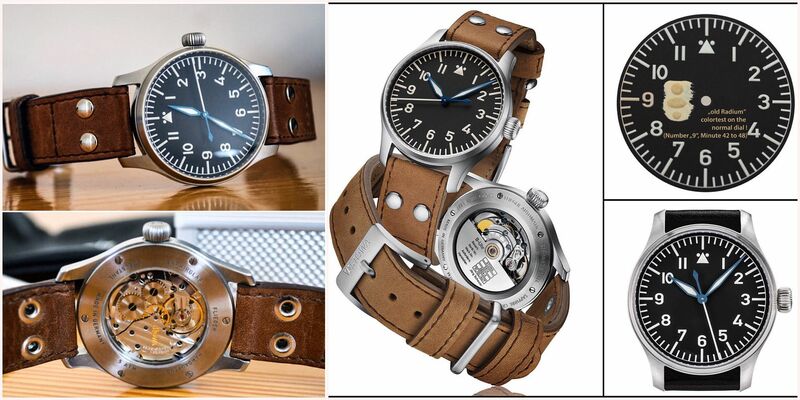 that the brightness and longevity will be more akin to C1 Luminova than the C3 typically used in the Flieger Klassik line, perhaps Jorg has a trick up his sleeve (tbd)? There may be multple methods at creating the tint. I have asked Jorg via Sandra about the dial lume. If he answers, I will share it here. Either way, I want a central seconds, manual wind, hacking no logo Type A Flieger. Deliveries are supposed to begin in May, but I suspect those are the initial deliveries among the 90. It is difficult to actually visualize how it will look because the Stowa website only shows the ETA 2824-2 automatic version, but the dial, case, crown and strap are likely to same (right). I can only assume some similarity to the ETA 2801-2 models of the past (left). Last edited by iim7v7im7; February 11th, 2017 at 22:45. I'm guessing the handwind will be a 2801 even though the web site says 2824? Last edited by bay; February 12th, 2017 at 01:45. No, it says a 2804 (same as a 2801 but with a date wheel). Does all the flieger limited edition comes with the old rhodium indices markers i.e. Similar to the picture shown for the 36mm. I would be tempted to get the klassic sport flieger if it has it as well. Yes, that's the distinguishing element of all of these LEs. Baumuster B says 2824. Typo? I also ordered a handwind limited edition flieger with no date. I emailed stowa about it and they said it would have an eta 2804 but also that they would modify it to both remove the date wheel and the crown position for setting the date (for the no date model of course). iim7v7im7 and svetoslav like this. We will remove the date wheel and modify the crown position so that the crown won’t have the extra position.